The Wood SWCD is dedicated to the wise use of local natural resources to address regional concerns. Natural resource concerns are increasing. Local ‘boots on the ground’ offers the assistance and availability of conservation dollars, conservation practices, and conservation education to improve the quality of life for present and future generations. The district supervisors and staff work locally but think regionally. Western Lake Erie Basin does not stop at the water’s edge. The Wood SWCD partners with other districts, local farmers, county residents, and private entities to promote conservation practices from ag to urban communities. Educational activities, workshops, field days, and various media offers the opportunity for citizens to take an active part in conservation right where they live. The mission is dedicated to the wise use of natural resources to address local concerns. Natural resource concerns are increasing. Local ‘boots on the ground’ offers the assistance and availability of conservation dollars, conservation practices, and conservation education to improve the quality of life for present and future generations. Learn more about the history of Soil and Water Conservation Districts by visiting the Ohio Department of Agriculture . Regardless of where you live in Wood County, the rain that falls on your property eventually finds its way to the Western Basin of Lake Erie. Though the path the water follows may be different, we all contribute to the water quality – or lack of water quality – in Lake Erie. 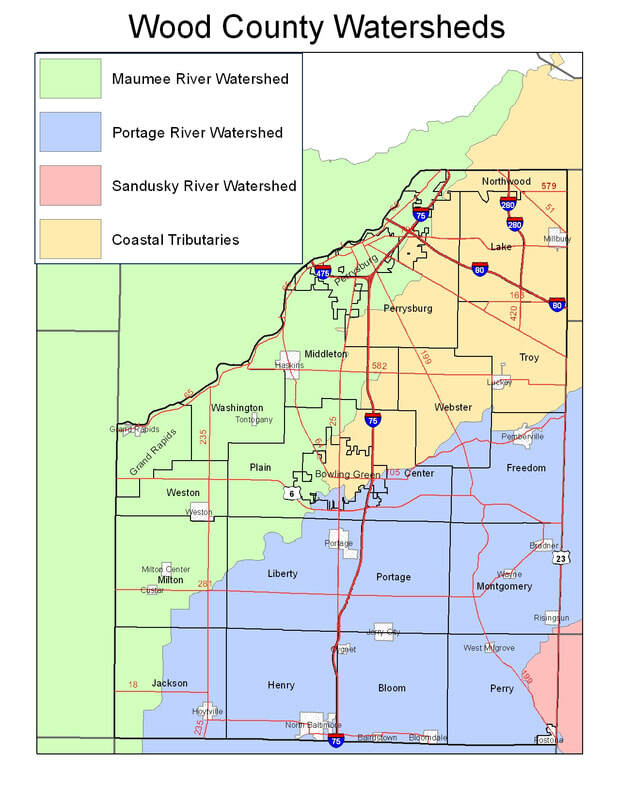 Most of the southern part of the county is in the Portage River watershed. The headwaters of the Portage are in northern Hancock County, not too far north of Findlay. Many tributaries, including Rocky Ford, Needles Creek, Rader Creek, Bull Creek, and the named branches flow north into Wood County. They are eventually gathered up by the Middle Branch, which joins the North Branch in Pemberville and flows northeast to Oak Harbor and Port Clinton. The northwestern part of the county is drained by the Jackson Cutoff, Beaver Creek, Tontogany Creek, and Grassy Creek. These all drain north as well, joining up with the Maumee River. The Maumee flows past Perrysburg and Rossford before entering Lucas County. It joins Lake Erie at Maumee Bay. In the northeastern part of Wood County, there are numerous small channels called “Lake Erie Direct” tributaries. As you might guess, they flow directly into Lake Erie and are not part of a larger river system. These include Toussaint, Packer, Crane Creek, and Cedar Creek. A small corner of Wood County between Risingsun and Fostoria is part of the Sandusky River watershed. ​The Wood Soil and Water Conservation District (SWCD) is a political sub-division of the State of Ohio, formed by a referendum petition and chartered on July 8, 1949. As a unit of state government, the district was organized and operates under the provision of Chapter 940 of the Ohio Revised Code. The Wood SWCD includes all the land within Wood County. A Board of Supervisors sets the policies of the district. The residents and landowners of the district elect five supervisors each for a three-year term. It is the duty of the board to guide the work of the district, utilize funds for equipment and supplies, and hire personnel to carry out the work of the district. Their dedication to conservation work is reflected in the time they volunteer to carry out these duties and attend many meetings and training throughout the year. The district operates on funding provided by the Wood County Commissioners which is matched by the Soil and Water Conservation Commission. Sales, programs, and equipment rentals generate additional funds. The Natural Resource Conservation Service (NRCS) provides equipment, supplies and personnel to give technical assistance to the district. ​The major function of the district is to determine the natural resources needs and implement programs to protect and develop these resources. Programs of the district are developed cooperatively with the Natural Resources Conservation Service (NRCS), Ohio Department of Agriculture (ODA), Farm Services Agency (FSA), and The Ohio State University (OSU) Extension Service. Additional programming assistance is received from the Ohio Federation of Soil and Water Conservation Districts (OFSWCD). The district assists landowners in the Agricultural and Urban Sediment and Pollution Abatement Standards that have been adopted by local, state and federal governments. The application of conservation practices is a cooperative effort between the district and the land users’ voluntary implementation of the recommendations of the district. The district works to educate the public through school programs, workshops, demonstrations, and outreach meetings on conservation practices, soil health, and maintaining healthy watersheds. Not all natural resources are renewable. Those that are may take decades, centuries, or millennium to replenish. Water is a finite resource. The earth has no more and no less water that when the earth began. However, the quality of our water resource is of great concern world wide. It takes 500 years to form one inch of soil, but it can be blown or washed away in seconds. As stewards of this earth, it is our responsibility to improve and maintain the resources offered to us. SWCD supervisors, staff, and conservation partners take a strive to be proactive in education and best management practices in preserving the local natural resources while maintaining our modern lifestyle.